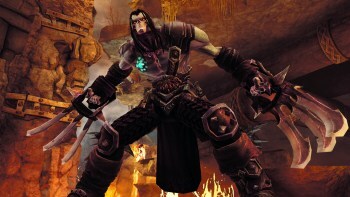 Crytek USA Corp wants to see Darksiders "at home with its creators." In the wake of THQ's demise earlier this year, some studios and IPs found homes with new publishers, but not all were so lucky. One of the casualties was Darksiders developer Vigil Games, which closed immediately after not being picked up in the THQ bankruptcy auction. Some Vigil staff soon found themselves at Crytek's new Austin studio, run by former Vigil studio head David Adams. After taking a couple of months to get settled, Adams has announced his intention to bid on the Darksiders IP, declaring that "it belongs at home with its creators." Adams broadcasted the news on Twitter, saying that he "put 7 years of heart and soul into that franchise." Vigil co-founder Ryan Stefanelli confirmed the announcement with Destructoid, stating, "When the Darksiders IP goes up for auction, Crytek will be bidding for it... Not much more to say since the rest is left up to courts and legal shenanigans, but we're all excited at the prospect." When Crytek USA Corp formed earlier this year with Adams at the helm, a representative stated that "Crytek USA won't work on a new Darksiders game," adding "it is too early to share any future plans" for the studio. THQ's demise was sad for the industry, but the silver lining is that many of its developers, along with the games they were working on, have found new publishers. I don't know what it feels like to work on a franchise for seven years only to have it slip away, but I can't imagine it's pleasant; best of luck to Adams in his quest to acquire Darksiders and, presumably, keep the IP alive. We'll be keeping an eye on this and all of the THQ properties that are still up for grabs, and we'll keep you posted.